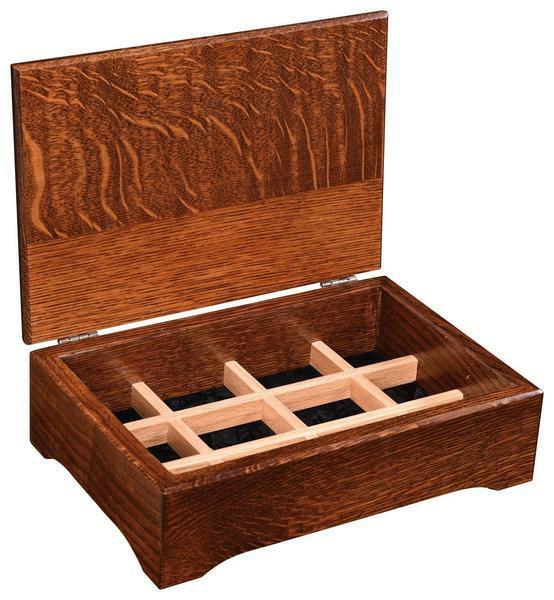 A special place for your jewelry, the Amish Deluxe Jewelry Box comes in your choice of solid wood. With a divider tray that neatly organizes rings, bracelets, earrings and more, there's no more concern about tangles or losing a special piece. The Amish Deluxe Jewelry Box makes a beautiful gift. It's handmade and special and will perform for generations, becoming an heirloom that can be handed down for years to come. Can one small jewelry box really add that much to the decor of the room? The answer is yes. The solid wood brings a natural beauty to the room and looks stunning in its finish color. The wood grain brings character to this mini chest, and displayed on a bedroom dresser or nightstand, a wood jewelry box adds an interesting shape. This wood jewelry box is handmade in a woodshop in Ohio. Amish craftsmen carefully choose the wood, then cut it, sculpt it, refine it and finish it, creating a truly beautiful jewelry box. For a look inside an Amish Woodshop, take a tour in this DutchCrafters video. Our Furniture Specialists can tell you more. Get in touch via phone or email with any questions. We'd love to hear from you. Thank you for shopping with DutchCrafters.